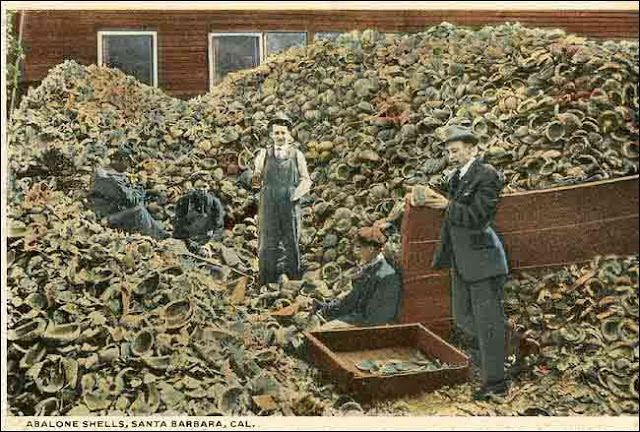 Because of indiscriminate exploitation of abalone for meat and shells, many species have dwindled to the edge of extinction. 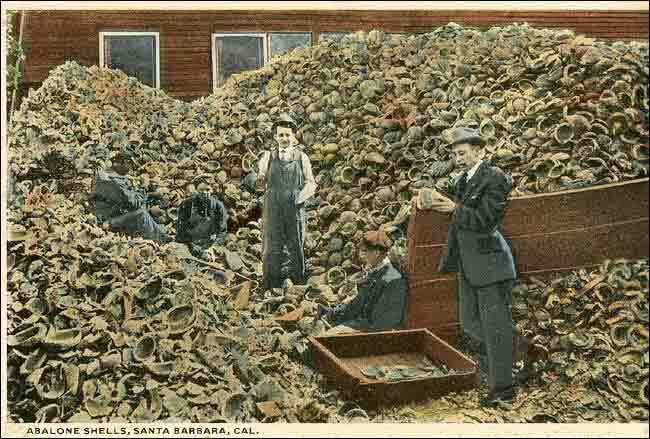 Seven species of abalone are currently being managed by California Fish and Game: some in recovery status. A lesson here is that commons present privileges as well as shared responsibilities. Sometimes, informed regulation is the best option. Ground zero for the new regulatory environment for water use in California is September 17, 2014. The State Senate passed legislation that initiated--for the first time in recorded history--mandates for reporting groundwater use and requirements for all high priority (high-quantity, see below) ground water users to submit plans for pumping, monitoring, and managing groundwater use. Central Valley and Central Southern Coast are both priority areas for regulation. Until last year California had legally maintained that water is best managed at the local level, which meant in effect unmanaged. Going even further towards rationalizing laissez-faire-laissez-allez, the Texas Supreme Court concluded in 1904 that groundwater was too “secret, occult, and concealed” to ever regulate. Net: groundwater, on which we all--worldwide-- depend for well-being of home and business, has not been well managed, with catastrophic results. 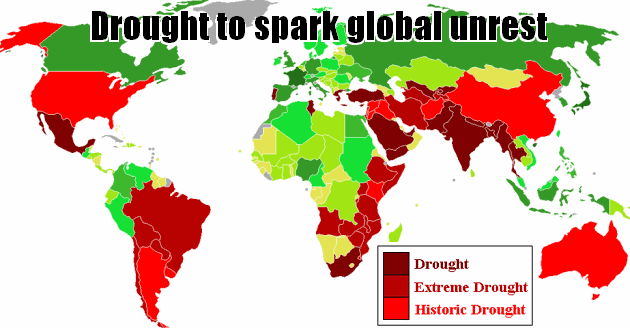 Worldwide, water stored for millions of years is being rapidly depleted, with no quick fix in anyone's lifetime. But the idea of free water shared communally is about to radically change, albeit very possibly not "just in time." Regardless, the days of the water occult are over. NASA satellite systems have not only revealed what was concealed, but they have published documents showing that throughout the world, both shallow and deep groundwater resources are being depleted more rapidly than can ever be replenished. Lack of good water management has led to possibly irreversibly damaging results: in California, the Middle East, parts of Africa, India, Pakistan, and China. Although this is an unprecedented disaster, the urgent usually pre-empts the important, and so it is with water. What we perceive as most urgent, as a species, is what is most likely to effect us today. Tomorrow's threats are discounted. The fact that most water systems run regardless of borders has led to what is known as a tragedy of the commons, meaning resources once considered as free and belonging to everyone, are exploited by individuals, communities, and nations for their local self-interests to the point of depletion. As the world runs out of clean water, water use is being increasingly controlled, divisive, and fought for and over: so it pays each of us to know our water and its ways. The water running deepest and oldest--perhaps millions of years, is fossil water, which like coal and oil is a non-renewable resource. The world's best known fossil water aquifers (rock storage structures)--the Ogalalla in the US, the Disi in Jordan, the Nubian in North Africa have been drawn down continuously over the past fifty years. Unlike fossil aquifers, when replenishable aquifers are drawn down, the pumping rate automatically defaults to the rate of recharge.When fossil water sources are depleted, the water has run out. Shallower is the water that supplies the demands of over 30 million Californians and irrigates more than 5,680,000 acres of farmland. The source of this supply is rain and snow that falls to earth, surface water that has accumulated over time above ground and in top soils, and water that has trickled over hundreds maybe thousands, of years into aquifers underground--so-called ground water. All are complex and as far as individual demand goes, unreliable. Both surface and ground water are increasingly regulated by increasingly remote agencies. Stakeholders who hope to participate in and influence the oncoming regulations need to understand basic hydrology, particularly as it pertains to their habitats. Both the privileges and responsibilities of stewardship come with knowledge.. The increased demand for water by a population of over 7 billion has led to depletion of groundwater, which recharges mainly from precipitation, but in most regions of the world, much slower than current demands.The USDA reports that in parts of Texas, Oklahoma, and Kansas-—three leading grain-producing states-—the underground water table has dropped by more than 30 meters (100 feet). As a result, wells have gone dry on thousands of farms in the southern Great Plains and are drying up in California's Central Valley and in Southern California. Central Valley California agribusiness is possibly among the world's worst offenders of groundwater exploitation, but as the world's breadbasket and major revenue producer in California and the US, agribusiness pushes hard on legislators to go slow and easy with reform. Recent mandates in California have targeted residential and urban use and ordered farmers to become planners, but for now, not much more. Prolonged drought causes water users to seek supplies underground. Because ground water (underground water) is concealed and unmanaged,it is easily exploited, which results in the fresh water disaster facing us today--worldwide. Typically, early responses include attempts at controlling loss through legislation, which is what is happening in California today--early summer 2015. Stakeholders who would like to participate in their regulatory water futures can start by understanding what is at stake. What are the key concepts and facts anyone hoping to make informed decisions and action must understand? Californians need to know where their water comes from, who uses it and manages well and who doesn't, what are aquifers, recharge, etc., what are the great water projects that have turned the Central valley into the most productive agricultural region in the world--artificially. This post highlights the ground water problem using images from water stressed regions around the world to condense complex information into a simple informative snapshot. 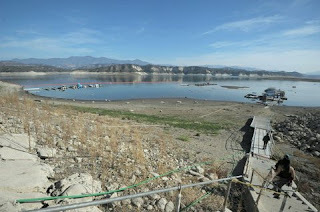 The next post summarizes key water concepts such as replenishable vs fossil aquifers, water footprints and diverse meanings for different contexts, and agribusiness water supply systems, with a focus on California water and agriculture, using the Central valley and Southern Central Coast wine industries as illustrative cases. The third post in this 3-part series looks at how stakeholders might influence water management legislation over the next ten years. Continuing from post two, the inseparability of water, food, agriculture, and economic issues in California is exemplified using the powerful economic determinative of the Wine Industry in the Central Valley and Southern Coastal areas of California. Approximate location of maximum subsidence in the U.S., identified by research efforts of Dr. Joseph F. Poland (pictured). Signs on pole show approximate altitude of land surface in 1925, 1955, and 1977. 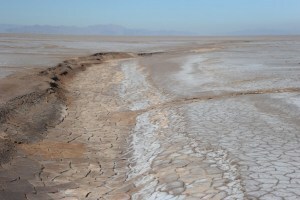 The site is in the San Joaquin Valley southwest of Mendota, CA. Overdrafting of 122 million acre-feet (size of Lake Tahoe) groundwater has caused a geologic catastrophe in the Valley, where land is sinking about a foot a year, considered monumentally unsustainable. The indicator that trumped CO2e as measure of most concern to most people worldwide is the water footprint. 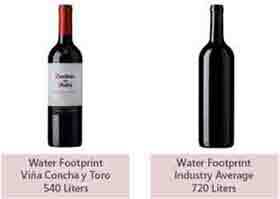 Wine's water footprint, called "mammoth" in an article posted in Wine Industry Insight, is used in this post series to illustrate the almost unbreakable link between agribusiness, economics, legislation, understanding, and water use in California. Many other crops have greater water footprints, and even in the wine industry, footprints vary with region and accounting methods. more in the next post. Fertile Crescent drying up: The Euphrates flows from Turkey then to Syria and last to Iraq. Five dams in turkey and Two in Syria have led to a trickle reaching Iraq. Farmers have tried to compensate by drilling wells, which has led to massive overdraft of groundwater. More than half of Earth’s 37 largest aquifers are being depleted, according to gravitational data from the GRACE satellite system. 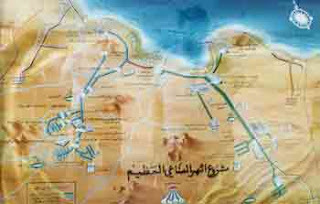 The Nubian aquifer supplies water to a massive water delivery system providing drinking water and irrigation. This fossil aquifer is a non-renewable resource. The end of June 2015 legislators passed a budget bill requiring metering for users diverting more than 10 acre-feet of water annually and allows agencies to issues fines up to $10,000, plus up to $500 per day for continued violation, to people who violate water conservation measures. Colorado River, an overallocated water source, supplies 4,400,000 acre feet of water per year to California. The Colorado River Basin has suffered drought for ten years, with riverbasin aquifers declining steadily because of uncontrolled overdrafting. Six main systems of aqueducts and water structures transport, store, and redistribute water in California: the State Water Project (SWP), the Central Valley Project. miscellaneous Colorado River delivery systems, the Los Angeles Aqueduct, the Tuolumne/Hetch Hetchy system, and the Mokelumne Aqueduct. The governmental agency responsible for water planning and oversight is the California Department of Water Resources. 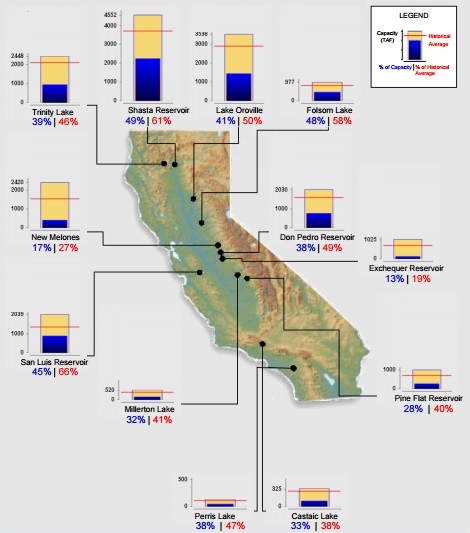 Lake Cachuma in Santa Barbara, one of four Santa Barbara region water storage facilities, is at about 26 % of capacity as of summer 2015.; Twitchell Reservoir is at 0%; Jameson at 19% and Gibraltar at 11%. 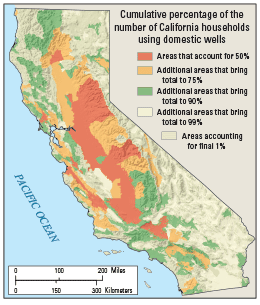 Starting in 2012, the GAMA (California Groundwater Ambient Monitoring and Assessment) Priority Basin Project began an assessment of water resources in shallow aquifers in California that provide water for domestic and small community-supply wells. These water systems are of special interest because shallow aquifers respond more quickly to human impacts than deeper aquifers. 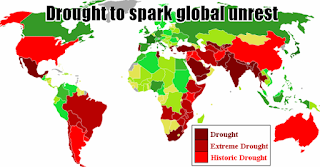 An intelligence report based on classified information warns water shortages will soon lead to global unrest and threaten the National Security of the United States.,,The immediate concern is that depleted groundwater will destabilize food and water supplies and trigger conflict. 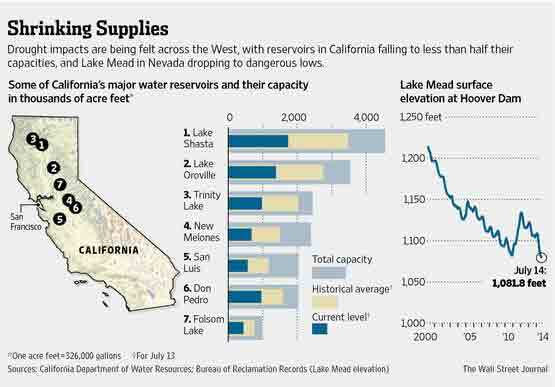 The Middle East lost 117 million acre feet of freshwater between 2003 and 2009, compared to 20 million lost in the Central Valley over the past 10 years. 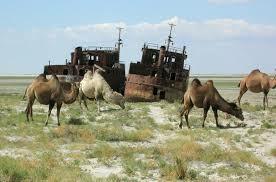 About one-fifth of the loss in the Middle East is attributed to drought. ; one-fifth was lost from surface water resources such as lakes and streams and about 60 % drained for agricultural purposes from aquifer n not recharging fast enough. GRACE data paint a striking portrait of regions in which U.S. freshwater reserves (largely groundwater) have increased (blue) or decreased (red) since 2003. Areas of concern include California’s Central Valley, the southern High Plains Aquifer, drought-stricken areas in the South, and the Upper Missouri River Basin region. Image courtesy of Jay Famiglietti and Caroline de Linage, UC Irvine.